Joshua 1:8: This book of the law shall not depart out of your mouth, but you shall meditate on it day and night, that you may be careful to do according to all that is written in it; for then you shall make your way prosperous, and then you shall have good success. Psalm 1:1-6: Blessed is the man who walks not in the counsel of the wicked, nor stands in the way of sinners, nor sits in the seat of scoffers; but his delight is in the law of the LORD, and on his law he meditates day and night. He is like a tree planted by streams of water, that yields its fruit in its season, and its leaf does not wither. In all that he does, he prospers. The wicked are not so, but are like chaff which the wind drives away. Therefore the wicked will not stand in the judgment, nor sinners in the congregation of the righteous;for the LORD knows the way of the righteous, but the way of the wicked will perish. John 15:7: If you abide in me, and my words abide in you, ask whatever you will, and it shall be done for you. Matthew 8:16-17, it says: That evening they brought to him many who were possessed with demons; and he cast out the spirits with a word, and healed all who were sick. This was to fulfill what was spoken by the prophet Isaiah, "He took our infirmities and bore our diseases." Isaiah tells us that by "his stripes we are healed", so meditating on the Passion of the Christ, either through the Rosary, looking at a crucifix, doing the Stations of the Cross, through meditation, or by watching the movie "The Passion of the Christ", is good medicine for what ails us. Isaiah 53:5: But he was wounded for our transgressions, he was bruised for our iniquities; upon him was the chastisement that made us whole, and with his stripes we are healed. Acts 1:8: But you shall receive power when the Holy Spirit has come upon you; and you shall be my witnesses in Jerusalem and in all Judea and Samaria and to the end of the earth." 1. Proverbs 4:20-22: My son, be attentive to my words; incline your ear to my sayings. Let them not escape from your sight; keep them within your heart. For they are life to him who finds them, and healing to all his flesh. 2. Isaiah 6 :10: Make the heart of this people fat, and their ears heavy, and shut their eyes; lest they see with their eyes, and hear with their ears, and understand with their hearts, and turn and be healed." 4. John 12:40: "He has blinded their eyes and hardened their heart, lest they should see with their eyes and perceive with their heart, and turn for me to heal them." "If you will diligently hearken to the voice of the LORD your God, and do that which is right in his eyes, and give heed to his commandments and keep all his statutes, I will put none of the diseases upon you which I put upon the Egyptians; for I am the LORD, your healer." Job 4:4: Your words have upheld him who was stumbling, and you have made firm the feeble knees. 2 Kings 5:14: So he went down and dipped himself seven times in the Jordan, according to the word of the man of God; and his flesh was restored like the flesh of a little child, and he was clean. Matthew 9:20-22: And behold, a woman who had suffered from a hemorrhage for twelve years came up behind him and touched the fringe of his garment; for she said to herself, "If I only touch his garment, I shall be made well." Jesus turned, and seeing her he said, "Take heart, daughter; your faith has made you well." And instantly the woman was made well. The list is endless, but you HAVE TO READ THE BIBLE to discover them. Another mention of personal healing in the Bible involves prayer for others, and not just for you and your immediate family. Prayer to save poor sinners from hell who you don't even know is a great way to show God that you don't just think of yourself. It is important to remember that the devil can afflict us with pain. Part of the horror of sin is that the after-effects of our transgressions can make us physically sick, because the devil gets control over our lives every time we sin. And he loves to see us suffer. Luke 13:11: And there was a woman who had had a spirit of infirmity for eighteen years; she was bent over and could not fully straighten herself. The Bible also talks about the healing power of physicians and pharmacists. If you read the whole paragraph below, it also mentions the power of prayer, so praying for the efficacy of the drugs before you take them, praying for the doctor to diagnose you properly, and praying for the doctor to perform surgery well is a doubling down of the healing power God gave to physicians and to medicines. It also talks about being sorrowful, and how that leads to death. So start praying for God to fill your life with JOY! 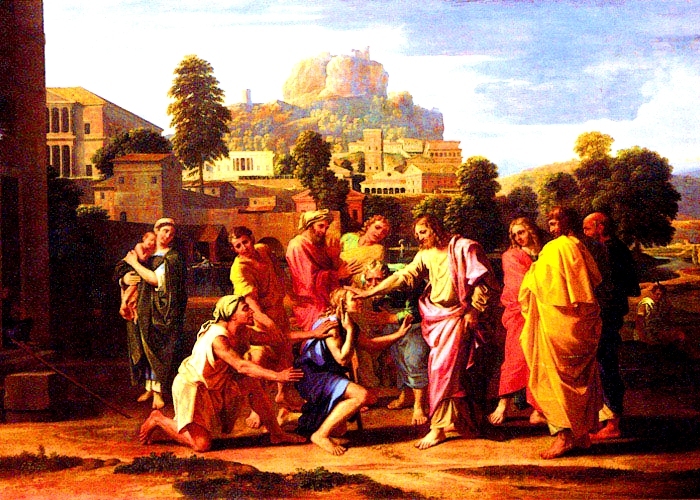 Sirach 38:1-23: Honor the physician with the honor due him, according to your need of him, for the Lord created him; for healing comes from the Most High, The skill of the physician lifts up his head, and in the presence of great men he is admired. The Lord created medicines from the earth, and a sensible man will not despise them. Was not water made sweet with a tree in order that his power might be known? And he gave skill to men that he might be glorified in his marvelous works. By them he heals and takes away pain; the pharmacist makes of them a compound. His works will never be finished; and from him health is upon the face of the earth. My son, when you are sick do not be negligent, but pray to the Lord, and he will heal you. Give up your faults and direct your hands aright, and cleanse your heart from all sin. Offer a sweet-smelling sacrifice, and a memorial portion of fine flour, and pour oil on your offering, as much as you can afford. And give the physician his place, for the Lord created him; There is a time when success lies in the hands of physicians, for they too will pray to the Lord that he should grant them success in diagnosis and in healing, for the sake of preserving life. He who sins before his Maker, may he fall into the care of a physician. My son, let your tears fall for the dead, and as one who is suffering grievously begin the lament. Lay out his body with the honor due him, and do not neglect his burial. Let your weeping be bitter and your wailing fervent; observe the mourning according to his merit, for one day, or two, to avoid criticism; then be comforted for your sorrow. For sorrow results in death, and sorrow of heart saps one's strength. In calamity sorrow continues, and the life of the poor man weighs down his heart. Do not give your heart to sorrow; drive it away, remembering the end of life. Do not forget, there is no coming back; you do the dead no good, and you injure yourself. "Remember my doom, for yours is like it: yesterday it was mine, and today it is yours." When the dead is at rest, let his remembrance cease, and he will receive a gift from the king. let him not leave you, for there is need of him. and be comforted for him when his spirit is departed. All of the above should alert you to the necessity of studying your Bible, and not just reading it casually and infrequently. If you want to be healed from arthritis, cancer, or whatever, it is most important that you study and implement God's Word in your life. There are numerous good Bible studies available, including the St. Paul Center for Biblical Theology, which is free. Another GREAT Bible study (which is not free) is The Great Adventure Catholic Bible learning system. There is a lot to learn about God and His Word, and if you want to be healed, learning it AND internalizing it with your eyes, ears, and heart is the beginning of your healing journey. And never forget to ALWAYS pray for God's will to be done. It may be that your suffering for a while may be what you need to attain heaven later on (Romans 8:17), or your suffering may be needed for the salvation of others. (Colossians 1:24). After all, if you had the choice of either being healed from disease or going straight to heaven when you die, the latter is always better. No one on earth really knows how it works, but if you always pray for God's will to be done, as we all say in the Our Father (and really mean it), then whatever happens will be for the best in the long run, because we can always trust God to do what is right, even if causes us a little pain now. Don't wait until you get cancer or get injured in a car wreck to begin this faith journey through God's holy Word. It might be too late then. Start now, so if you do get sick or injured later on down the road, you are primed and ready to go to receive God's healing in your life. And don't forget to also pray for preventative healing; that is, pray in advance for your immune system to be strengthened, and that you won't get sick or injured in the future. It takes a lot less faith for that to happen, than it does to be cured after the fact. Want more information on Biblical Healing?